What started in autumn 2017 as a visit of a team of clinicians from Musgrove Park Hospital to the Children's Hospital team in Ljubljana, Slovenia to see their journey to a paperless hospital has come to an end. 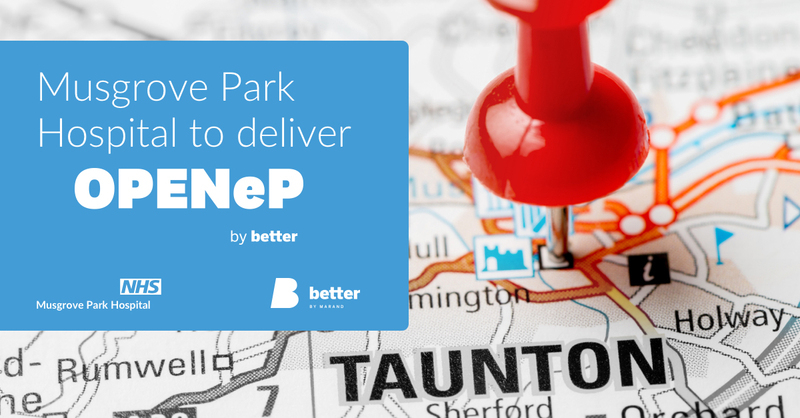 Musgrove Park Hospital in Taunton has formed a partnership with Better, CGI and Apperta Foundation that will help both patients and healthcare professionals delivering an e-Prescribing and medicines administration solution (ePMA) to increase the quality of care. Musgrove Park Hospital run by Taunton and Somerset NHS Foundation Trust is one of the 16 acute GDEs (Global Digital Exemplar) in the UK. The Implementation of the ePMA solution was a logical step in their digital transformation. With OPENeP by Better, the hospital will get a high-end closed-loop medication management solution which will enable medical teams to raise the bar and safety for their patients using the solution. Musgrove Park Hospital is trying to be different from other GDE Trusts because they're going with what we call a post-modern approach. They will combine different vendors and different solutions to help them with their digital transformation, commented Anže Droljc, Head of Clinical Applications at Better. The hospital is aiming to go live on 1st of June next year so the process of implementation will take about one year. CGI is a reliable partner and Better’s role in the process is to support them to make sure that the rollout is successful because only with the successful deployment and the right approach the hospital can get the maximum from the solution. The Implementation will start on one ward, but in the long run, we would expect there to be about three to four departments using the solution in at least a year or two. Once OPENeP will be rolled out, the hospital staff will have all the information about medication management readily available on different computer solutions. So, doctors, nurses, and pharmacists will have a more precise overview of what's happening with patients concerning medications. One of the significant benefits of OPENeP is that medical teams will no longer have to search for paper records which can go missing during the patient’s stay. They will have proactive alerts which again means better outcomes for the patients due to fewer mistakes. Moreover, they will no longer have to rewrite any of the medication charts ever again. This is also a safety improvement as well as a massive improvement in time. For patients, many errors which would typically happen on paper, are being solved with e-prescribing. One of the essential elements is not having to transcribe all the prescriptions. This will help the patient as well, as there will be no transcription-related errors thanks to the solution, improved and simplified reconciliation, and doctors will be able to use the best-practice format, which will enhance the patient’s treatment. I think the implementation is just the first phase in the life cycle of a product, and the implementation plan is the first step in this story. I would expect that at Musgrove Park Hospital they will push this product and also themselves constantly forward and they will try to get even more improvements. I see this just as the start, so we are aiming for a marathon, not a sprint there, commented Roko Malkoč, OPENeP Product Manager. OPENeP by Better is an innovative closed-loop medication management system that fully supports even the most complex medication management scenarios in a simple and easy to use way. Decision support for situations known as “never events”, allergies, and dose range, as well as powerful integration options, empower doctors, nurses, and pharmacists, allowing them to improve patient safety, and deliver better and more personalized medical care.